Born in Watauga County, North Carolina in 1889, Albert Green Hopkins was one of the first true country musicians and one of the originators of “hillbilly” music. Hopkins was born to John Benjamin Hopkins, a state legislator, and Celia Isabel Green Hopkins. Both parents were musical. Hopkins’ father repaired organs as a hobby and played fiddle, piano and organ. His mother sang ballads and church music. Hopkins primarily played piano. The Hopkins family relocated to Washington D.C. in 1904 when Hopkins was fifteen. In 1910, he and his brothers Joe, Elmer, and John formed the Old Mohawk Quartet, a group that played around D.C., frequently appearing at the Majestic Theater. In the early 1920s, Hopkins moved to Galax, Virgina where he worked for his older brother, Jacob, was a doctor with an established practice. He also entertained his brother’s patients. Peer named their group “The Hill Billies,” much to the musicians’ consternation (none of the members of the group conformed to the “hillbilly” stereotype). 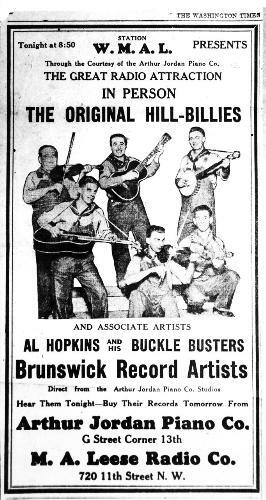 Alderman would later say that to them the word “hillbilly” was a “fighting word.” Nevertheless, Hopkins and his group were associated with the word hillbilly and they tried for a time to control the word’s use, at least as far as it was applied to music. Eventually, they were forced to accept that hillbilly had become a genre of music.